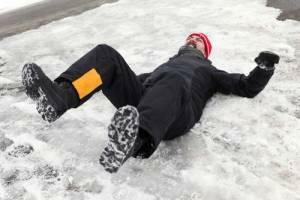 Who Can You Sue for Snow and Ice Fall Injuries? As winter approaches, and the precipitation changes from liquid to frozen with the dropping temperatures, the risk of falling and sustaining an injury greatly increases. The seasonal dangers caused by the presence of ice and snow are well known to those who live in northern climates, but this fact does not mean all snow and ice-related injuries are mere accidents with no responsible party to place blame. The injuries resulting from these falls can be significant, some requiring surgery, and a personal injury attorney should be contacted if a fall that requires medical treatment occurs. Property owners do have an obligation to keep the premises safe for others, but the law on recovery for injuries related to snow and ice falls in Illinois is complex, and blocks many cases from proceeding. An example of how serious these falls can be is illustrated in the case of a Greenwich, Connecticut, woman who sustained permanent injuries, including memory loss and a concussion, after falling on snow and ice in the town square. This type of dangerous accumulation is seen in numerous places over the course of a winter season, and understanding what property owners are generally obligated to do to protect third parties on the premises, as well as how courts view liability for falls from snow and ice, is essential information for slip and fall victims. Visitors and guests on another person’s or entity’s property are expected to be kept free from foreseeable danger and unreasonable harm. The person or business in actual possession and control of the premises is obligated under the law to exercise reasonable care to maintain the property in a safe condition or face liability if that duty is breached and someone is injured.